Gum disease is likely to be experienced by everyone to some degree during their lives. It can truly impact your smile if you don't keep an eye out for the signs. That being said, gum disease is actually very easily to kept bay. As long as you stick to a positive daily dental health routine then your gums and smile should have the best chance of staying healthy in the future. Let's Talk About Gum Disease. Gum disease can come in several different forms, some of which are more alarming than others and will require a much longer time to treat. At the low end of the scale is a mild form of gum disease, often known as gingivitis. 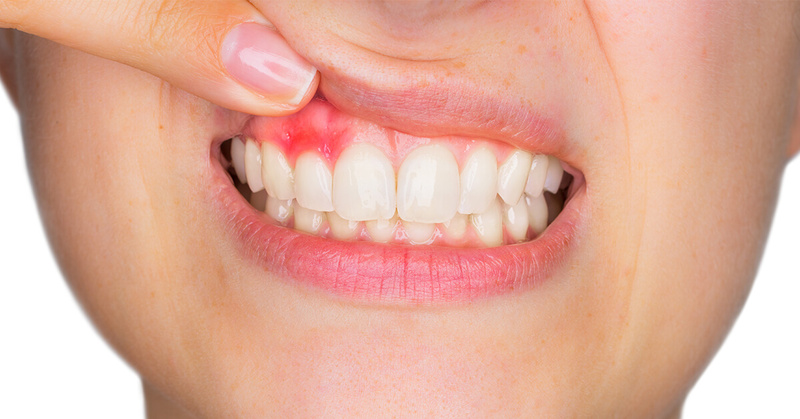 This is a type of gum disease where your gums can become swollen and sore. The usual cause of this is the build up of plaque on the edges of the teeth. Plaque can easily be built up on your teeth if you fail to remove it every day. The plaque contains bacteria that irritates your gums causing inflammation and subsequently, gingivitis. It may be the mildest form of gum disease but it certainly should not be overlooked. Left to it's own devices, gingivitis has the ability to evolve into a much more severe condition - periodontitis. Once at this stage your gums will be infected badly which can result in further damage to the surrounding bones and other tissues. As a result of this, your teeth lose the structure that holds them in place which can result in tooth loss. The first thing to take note of is that it is entirely possible to have no symptoms at all and yet still have gum disease. The pain from gum disease is mild in most cases and sometimes not present at all. This outlines a key reason for you visiting your dentist at least every six months for check ups. Who is at the Biggest Risk of Gum Disease? Studies have shown a strong correlation between gum disease and general health issues. Experts also think there is a hereditary factor involved with gum disease. This means that should gum disease run in your family then you may also be more prone to developing it. How Can You Prevent the Risks of Developing Gum Disease? You should ensure that you brush your teeth two times a day. This should include brushing just before you go to bed so that your teeth are super clean throughout the night. If you are unsure of the best way to clean your teeth then please ask your dentist for advice. Bamboo offer a special hygienist service to help give your teeth a thorough clean and give you any advice that you may need. Use the correct toothbrush and in the correct manner. Electric toothbrushes are often considered best at removing plaque, however you can always ask your dentist for more personalised advice. Floss daily. So many people overlook flossing yet you miss cleaning a huge portion of your teeth in doing so. Whats more is that those areas you miss are the areas most likely to be housing lodged food particles, the exact thing you need to remove! Avoid smoking. Giving up this habit will help to reduce the chance of getting gum disease as well as giving your health an overall benefit in many other areas. Visit your dentist every six months for a check up. This enables them to spot the subtle early signs of gum disease and advise you accordingly. If you have any concerns about gum disease or dental health in general then please get in touch with us or give the Bamboo Dental team a quick call on 029 2056 9769.